The Saroléa SP7 is an electric carbon-fiber phoenix on a mission from the gods of speed and industry. 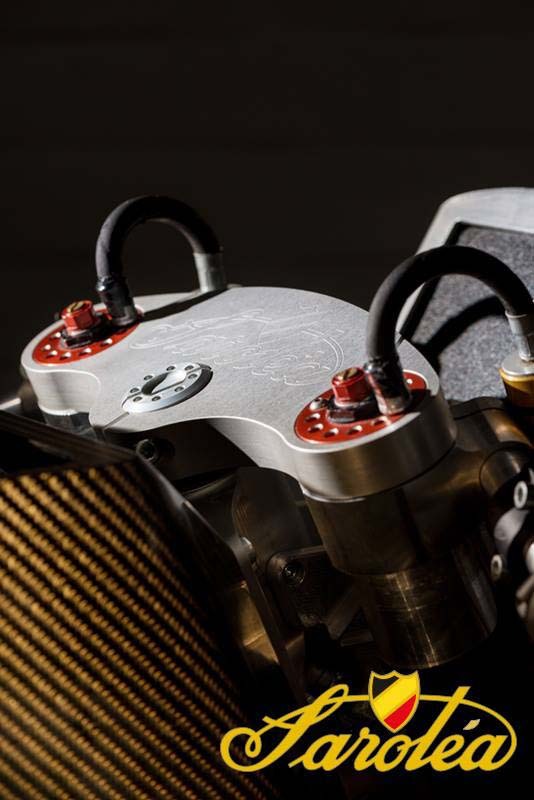 Just revealed to the public Saturday, it will soon take to the Isle of Man where it will battle the best battery bikes yet built for the 2014 TT Zero trophy. It will also relaunch a Belgian brand that, though it had an eight-decade record of producing motorcycles, has been dormant for the past 50 years. This looks like they have an electronically adjustable suspension. I was just looking at pictures of this bike from introduction to its most recent event at Spa to see if there have been any visible developments. Apart from them bolting on a taller windshield for the races, I noticed two large wires on the right side of the bike running its full length and curving over the swing arm (see photos below). Considering it is covering some of their sponsor stickers and they are being held together with cable ties, I would think it is a temporary arrangement but other than main battery power I can't think of what would need a pair of cables that size. Last edited by CaptainKlapton; 07 July 2014 at 1444. There was a really interesting 6-page article on the SP7 in the January edition of Performance Bikes in the UK, written by Renaud Amand, who runs the Belgian magazine Motorijder. Apparently, in running at the IoM the team found they needed to fit an extra radiator. I suspect that what you see are the pipes going from the radiator to cool the motor; with the existing pipes, which I read somewhere were made of carbon fibre, used to cool the controller. The pictures in the PB article also show that they’ve now moved the pipes so they don’t obscure the sponsors’ logos anymore. That looks like a well-sorted racer. All times are GMT -7. The time now is 1913.